Susan Collins is the third Republican senator to oppose the bill, leaving it just shy of the 50 votes it needs. Republican Sen. Susan Collins is a hard "no" on Graham-Cassidy, effectively delivering a fatal blow to the GOP’s latest Obamacare replacement bill. Collins released a statement Monday afternoon calling the proposal "deeply flawed." She added that Republican senators pushed the bill through the legislative process too quickly. Collins joins Republican Sens. John McCain and Rand Paul in publicly opposing the bill. Their opposition means the bill wouldn’t have the 50 votes it would need to pass if it were brought up for a vote. Collins’ announcement came shortly after the Congressional Budget Office said millions of Americans would lose medical coverage if the bill passed. Collins cited the CBO report in her statement. 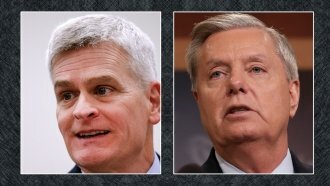 GOP senators were hoping to get Graham-Cassidy passed by Saturday. After that, 60 votes would be needed to prevent a Democratic filibuster — eight seats more than the Republicans hold in the Senate.